Barbiturates are drugs that depress the central nervous system. They are used for therapeutic applications for hypnotics, anticonvulsants and sedatives. This drug is taken orally as capsules or tablets. The effects resemble those of alcohol intoxication. Repeated use of barbiturates can lead to tolerance and physical dependency. Once a popular drug of abuse, barbiturates use has declined in recent years, due to doctors not prescribing the drug as often. Short acting Barbiturates taken at 400mg/day for 2-3 months produces a clinically significant degree of physical dependence. Withdrawal symptoms experienced during periods of drug abstinence can be severe enough to cause death. Only a small amount (less than 5%) of most Barbiturates are excreted unaltered in urine. 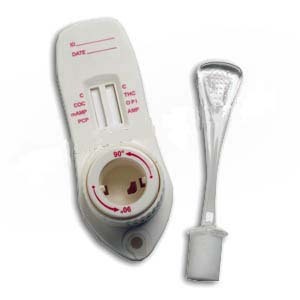 The BAR One Step Barbiturates Test Strip is a rapid urine screening test that can be performed without the use of an instrument. The test utilizes a monoclonal antibody to selectively detect elevated levels of Barbiturates in human urine. The One Step Drug Screen Test yields a positive result when the Barbiturates in urine exceeds 300ng/ml.